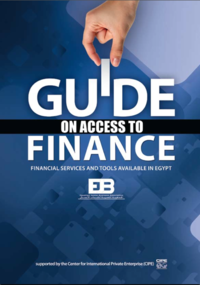 A team from the Finance and Banking Committee was formed, with the ultimate goal of spreading financing awareness among Small and Medium Enterprises (SMEs) through the issuance of the first “SMEs Access to Finance Guide” in Egypt. We held six seminars, each addressing one of the fields of finance. The first seminar was truly remarkable, the SMEs were the ones speaking, and the finance people were the ones hearing their problems. Each of the following seminars hosted a group of financial experts tackling the various problems facing SMEs and their access to finance. SMEs companies were present, discussions were open, and the long waited for dialogue had started. Banking, leasing, Private Equities and Venture Capital, Factoring and the stock market (NILEX), were all discussed in those seminars and the outcome was used as the seed for the guide. All whitepapers are available to you and free of charge. This whitepapers is provided by Egyptian Junior Business Association (EJB).